FDI flows to Africa continued to fall in 2016, to $59 billion, a decrease of 3 per cent (table 3). The resurgence of FDI into Egypt – the largest recipient of regional FDI – boosted inflows to North Africa. In contrast, low commodity prices hurt economic prospects in Sub-Saharan Africa and tempered investor interest. Flows dropped again in Angola, and they remained at relatively low levels in Nigeria and South Africa. East Africa registered relatively strong FDI inflows in 2016, with Ethiopia attracting more FDI than ever before. MNEs from developing economies are increasingly active on the continent, but those from developed countries are still the most important investors. Outward investment by African MNEs rose slightly (1 per cent to $18 billion), largely reflecting a rise in outflows from Angola (35 per cent to $11 billion), which offset a sharp reduction in flows from South Africa (-41 per cent to $3 billion). Combined FDI flows to developing Asia decreased by 15 per cent to $443 billion in 2016. The decline – the first since 2012 – was relatively widespread, with every major subregion, except South Asia, registering drops. The bulk of the overall decrease was caused by a return to prior levels of flows to Hong Kong (China), after the spike in 2015. Depressed values of cross-border M&As, which decreased from $50 billion in 2015 to $42 billion in 2016, also contributed. In East Asia, China’s relatively stable performance in inflows limited the overall fall in the subregion. In South-East Asia, inflows dropped, due mainly to decreases in Indonesia, Singapore and Thailand. In South Asia, FDI inflows were flat, increasing in India by only 1 per cent. In West Asia, the continued fall in FDI reflected regional conflict and the prolonged negative impact of low commodity prices. FDI outflows from developing Asia rose by 7 per cent to $363 billion. China’s continued surge drove up outflows from East Asia while sluggish outward FDI from Indonesia and Singapore dragged down outflows from South-East Asia. Outflows continued to slide in South Asia but bottomed out in West Asia. The downward trend in FDI flows to Latin America and the Caribbean accelerated in 2016, with inflows falling by 14 per cent to $142 billion, as investment slowed throughout the region. Economic recession, coupled with weak commodity prices and higher currency volatility, weighed heavily on flows to South America, which declined by 14 per cent to $101 billion. In Central America inflows also declined, by 14 per cent to $38 billion, adding to decelerations in gross fixed capital formation and export volumes. FDI inflows in the Caribbean, excluding financial centres, declined (-9 per cent to $3 billion), but with significant variations at the country level. Outward investment by Latin American MNEs plunged in 2016, as their foreign affiliates funnelled significant volumes of finance back to their parents. It fell by 98 per cent to $1 billion, reaching its lowest level since 2001. In 2016, FDI flows to transition economies jumped to $68 billion, after a steep decline in the preceding two years. The two main subregions experienced divergent trends. In the Commonwealth of Independent States and Georgia, FDI inflows almost doubled, owing to an exceptional rise in flows to Kazakhstan as well as a strong rise in flows to the Russian Federation. In South-East Europe inflows declined by 5 per cent, owing to fewer investments in the manufacturing sector. The list of main investor home economies shows a gradual shift in favour of new countries, especially China. At $1 trillion, FDI flows to developed economies rose 5 per cent. In Europe, record cross-border M&A sales were offset by a slump in intracompany loans, resulting in a 6 per cent contraction of inflows. Despite the Brexit vote, inflows to the United Kingdom rose to an unprecedented level, owing to the completion of several M&A megadeals. In contrast, inflows to developed countries in North America and the Asia-Pacific expanded, except in Canada. Inflows to the United States were at an all-time high, boosted by the completion of M&As, especially in the pharmaceutical industry. Australia reversed the decline seen over 2013–2015, while flows to Japan showed signs of sustained revival.FDI outflows from developed countries declined by 11 per cent to $1 trillion. Outflows from European countries fell by 23 per cent overall, mainly driven by sharp reductions in outflows from Ireland (down 73 per cent to $45 billion), Switzerland (down 71 per cent to $31 billion) and Germany (down 63 per cent to $35 billion). Outflows from North America were stable but, as in previous years, a large part of those flows was accounted for by retained overseas earnings. Japanese MNEs expanded their FDI through cross-border M&As, particularly in Europe. FDI outflows from developed countries declined by 11 per cent to $1 trillion. Outflows from European countries fell by 23 per cent overall, mainly driven by sharp reductions in outflows from Ireland (down 73 per cent to $45 billion), Switzerland (down 71 per cent to $31 billion) and Germany (down 63 per cent to $35 billion). Outflows from North America were stable but, as in previous years, a large part of those flows was accounted for by retained overseas earnings. Japanese MNEs expanded their FDI through cross-border M&As, particularly in Europe. After hitting a high of $44 billion in 2015, FDI inflows to the least developed countries (LDCs) were reduced by more than 13 per cent to $38 billion, representing 2 per cent of global FDI flows and 6 per cent of flows to all developing economies. Nonetheless, more than 20 LDCs attracted more FDI than in the previous year, led by relatively diversified major FDI host economies such as Cambodia and Ethiopia. China remained the largest investor economy in LDCs, far ahead of France and the United States. Although the sectoral distribution of announced greenfield FDI projects in LDCs underscores the potential for attracting more investment into the manufacturing and services sectors, oil and gas investments will continue to drive overall FDI flows into LDCs for the foreseeable future. After a major decline in 2015, FDI flows to the 32 landlocked developing countries (LLDCs) stabilized at $24 billion in 2016. 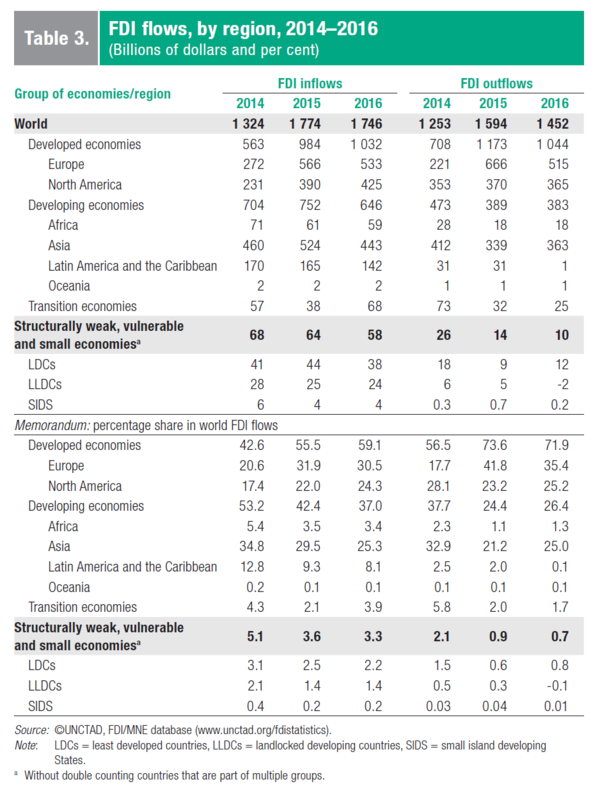 LLDCs continue to play a marginal role on the global FDI scene, accounting for less than 2 per cent of world inflows. The dynamics of FDI inflows diverged across regions and host economies. FDI was up in transition economies, especially in Kazakhstan, and inflows rose for a fourth consecutive year in Ethiopia, whereas flows to Mongolia turned negative. Although FDI to LLDCs continues to focus on natural resources, investment is shifting towards other economic activities, such as infrastructure and manufacturing, helping to mitigate these countries’ geographical disadvantage. Investors from developing countries, particularly China, account for an increasing share of FDI to LLDCs. FDI prospects warrant cautious optimism. Continued recovery still hinges on the evolution of commodity prices and political issues that could weigh on future FDI. The fragile FDI flows to the small island developing States (SIDS) decreased by 6 per cent $3.5 billion. The share of SIDS in global FDI flows has stagnated at less than 0.5 per cent in most years since 2009. Recoveries in Maldives and Mauritius were offset by reduced flows to a dozen other economies. Jamaica leads the SIDS in terms of attracting more diversified FDI. Among external sources of finance, the volatility of FDI flows into SIDS has become more pronounced since 2008, while remittances and official development assistance remain steady. Developing economies constitute 7 of the top 10 investors in SIDS, although the developed economies of Canada and United States lead in volume by a wide margin.